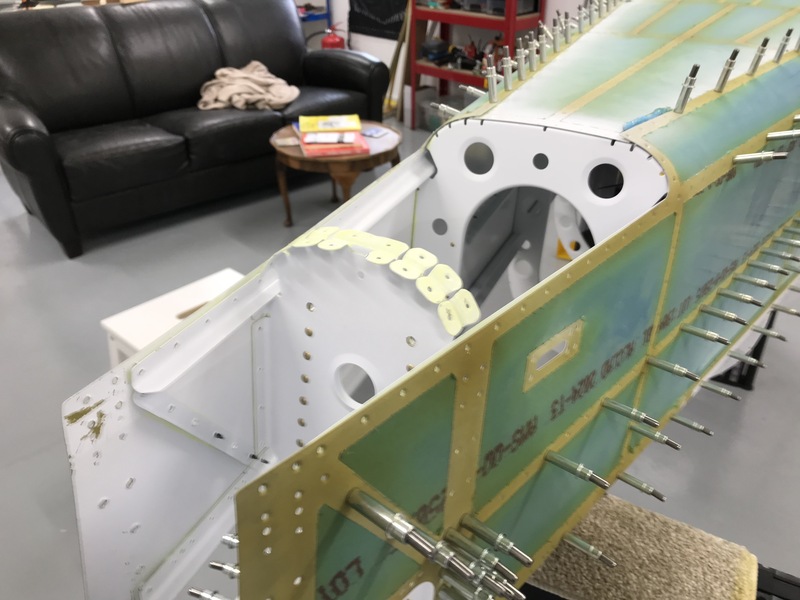 Work at the back of the Aft Fuselage starts with a trial fit of the above assembly together with the tail Spring Mount prior to riveting. This gives the opportunity to see whether the shape around the mount exit is correct. 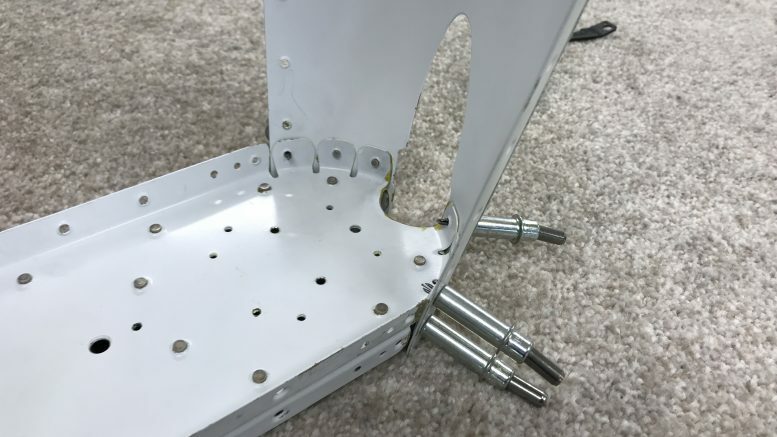 The skin was perfect, but I decided the scallop in the bulkhead needed adjustment to clear the weld around the mount (as highlighted by the manual). 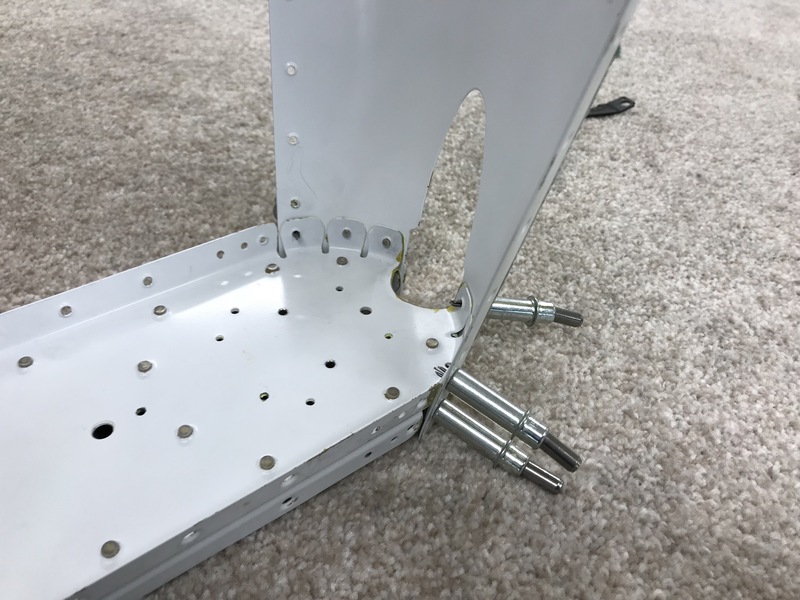 When happy that the mount is sitting comfortably, two holes are match drilled through the aft bulkhead into the mount. 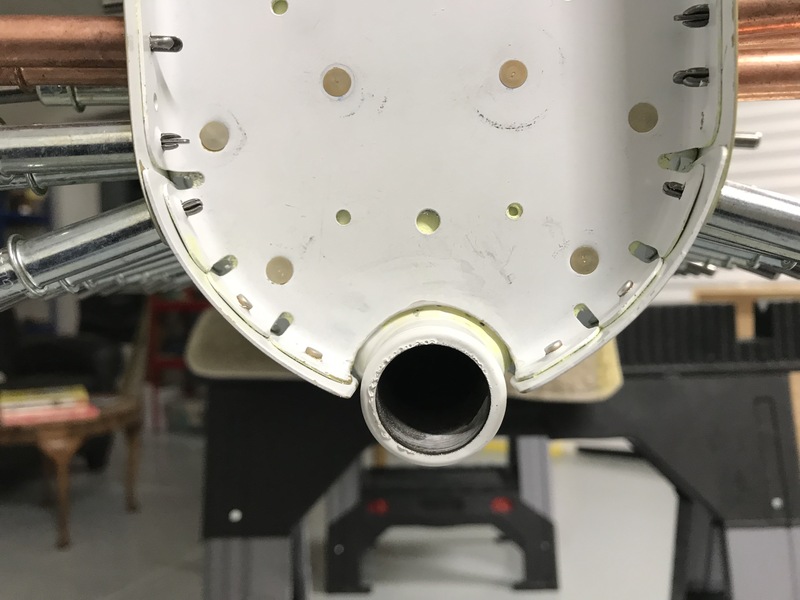 Since the Fin spar fits on the rear face of this bulkhead, these holes then are machine countersunk to fit a 426 rivet. 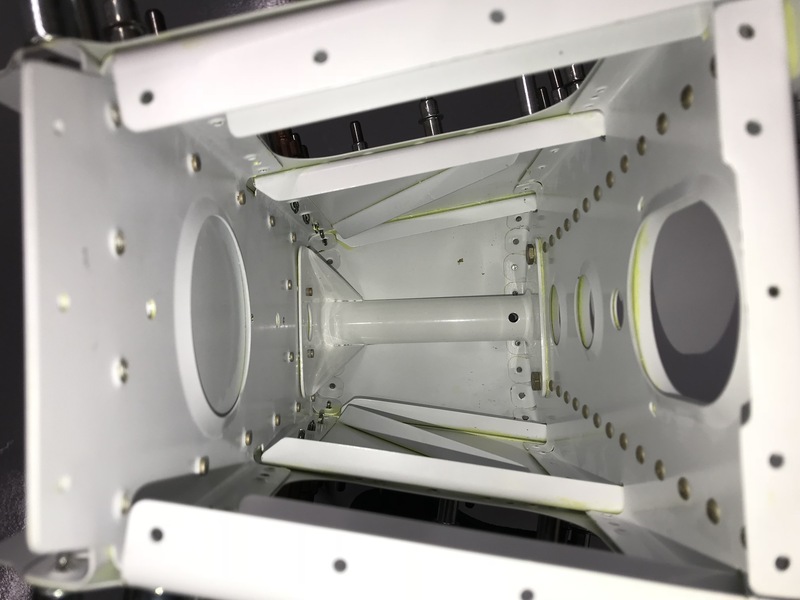 Then the mount is riveted to the aft bulkhead. 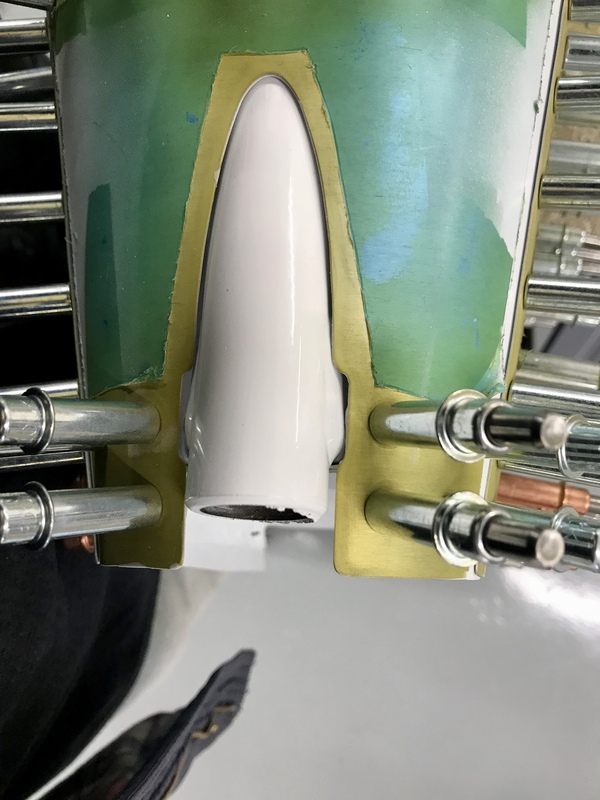 These rivets are only “keepers” … just to keep it stable until 1/4″ holes are match drilled through the fin spar much later and AN4 bolts secured. Will be a very solid job, important for that tailwheel! Next the aft bulkhead is riveted to the rear aft lower skin. 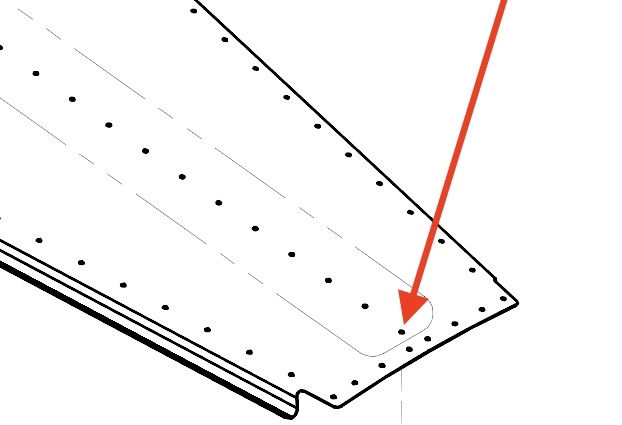 These rivets can be reached with the squeezer & Flange Yoke. As others have also found, the designated -3.5 rivets seemed just too short, so we used -4’s. Same for the 1411 bulkhead bottom flanges as well. My fellow Scottish builder gave me a really useful heads up … leave the above rivet out until later. This makes it easier to lift this portion of skin slightly to slip the front of the rear aft lower skin under. Thanks Chris! The mount front flange is shimmed as required … I needed one thick & one thin to close the slight gap between the mount front and the bulkhead. Then the fun starts, riveting the lower flanges of the bulkheads around the mount. It was hard to get a suitable bucking bar in a position to guarantee a nice rivet. 2 bad attempts needed removing, but eventually got the job done with acceptable shop heads….I hope. My friend Tim was helping with this, and still hard. Hopefully it will get easier as access improves! Be the first to comment on "Tail Spring Mount 10-18"